Inside Anton Krutz's shop. Photo by Tim Bridgham / KCUR. Merriam, KS – Anton Krutz worked in prestigious shops around the country before he opened his own here in Merriam over twenty years ago. 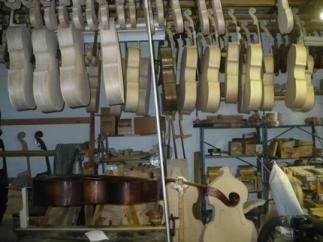 KC Strings is now is the only American shop making professional level violins, violas, cellos and basses. Krutz sat down with KCUR's Tim Bridgham to talk about the art of making a metal string and a wooden box into an instrument. This story was produced for KC Currents. To listen on your own schedule, subscribe to the KC Currents Podcast.